It worked! We had our first complete vegetarian meal and Eric really liked it. There were four different parts to the meal. 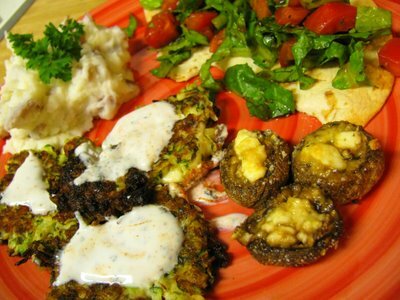 Stuffed Mushrooms, Tomato and Romaine Salad on a Crispy Tortilla, Skinny Mashed Potatoes and Zucchini Pancakes. Eric’s biggest concern for eating vegetarian is the texture. He said he’d miss the meat texture too much, and even tofu would be better than no meat. But this meal was full of all kinds of textures. Eric thought the mushrooms were very meatlike in their texture and a great choice. 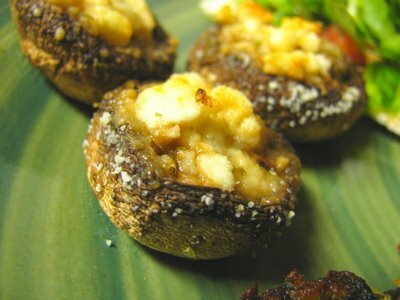 I simply mixed a little feta and parmesan with a dash of Italian seasonings, then packed it into the mushrooms. I baked them at 350 degrees for about 20 minutes. You want them to get nice and shriveled, I’ve undercooked them and it’s a big juicy mess! I had wanted to make bruschetta, but we didn’t have any bread. So I toasted a tortilla on the same cookie sheet as the mushrooms until it was nice and crispy. 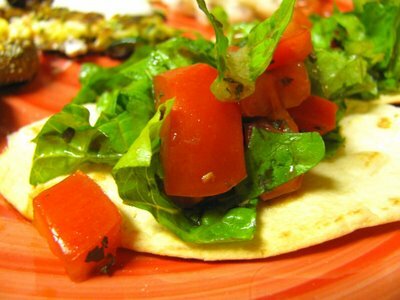 I cut it into 4 triangles and topped it with some tomatoes and romaine mixed with balsamic vinegar, olive oil and basil. The crispy tortilla was really good and I will definitely make this again. 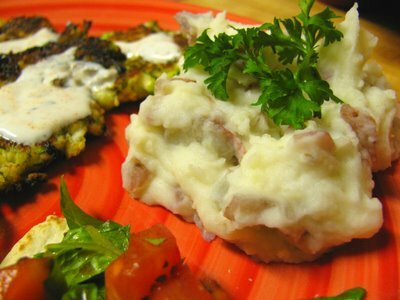 Finally, my skinny mashed potatoes. I call them skinny, not because of fat content but because I like to leave the skins on. Eric gave me the greatest compliment, saying he loves my mashed potatoes because since I can’t stand mushy textures I make them chunky with skins. I just glowed! See, I have this thing with texture too. I can’t handle really mushy stuff, even if I think it tastes amazing, I just start gagging! I can handle two bites of regular creamy mashed potatoes, even though I love them. These are so simple to make, especially because you don’t have to peel the potatoes. Wash the potatoes and chop them small (leaving skins on). Put in a pot of boiling salted water. Let boil about 15 minutes or until tender. Drain water out. Mix in remaining ingredients with a wooden spoon. Mixing will mash them enough because they are so small. Thanks Abigail, I’d love to have you over 🙂 Then if we’re ever in Japan you can take us out for sushi (our fav!). Growing up in Hawaii I sometimes forgot I wasn’t japanese, I can relate to your kids! I’d definitely take you out for sushi – my favorite is ikura (the bright orange colored clear fish eggs). Yum. Come on over anytime! 🙂 Love the looks of that mango lime dessert, too. Wow. Stunning.